My head was craned up highly, eyes shielded from the sun as I stood at the entrance of London Bridge Station. Slightly distracted from the airplane streaking across the sky from London City Airport, my main focus was on the triangular structure that stabbed the warm evening and cloudless sky. This is the Shard. 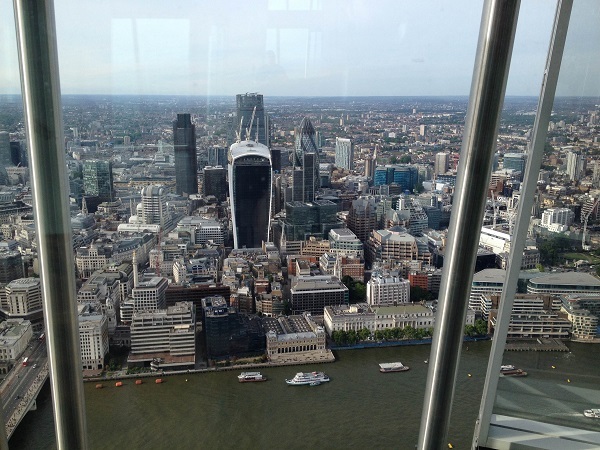 Made famous in 2012 becoming London’s tallest structure at 87 stories high, far outstripping the BT Tower, the Gherkin and even plenty of hotels with beautiful rooftop terraces, it has become one of the ultimate London attractions. On the 69th level, you can look across the panoramic skyline of what I believe is the greatest capital city of the world. The historic city opens up to you as far as you eyes can see (perhaps forty miles on a clear day) and landmarks are appreciated from a whole new perspective. The lift pinged and the doors opened. The evening sunlight streaked in, nearly blinding us but we stepped out. The scene that greeted us felt like we were on Mount Olympus as gods staring out at our domain below. 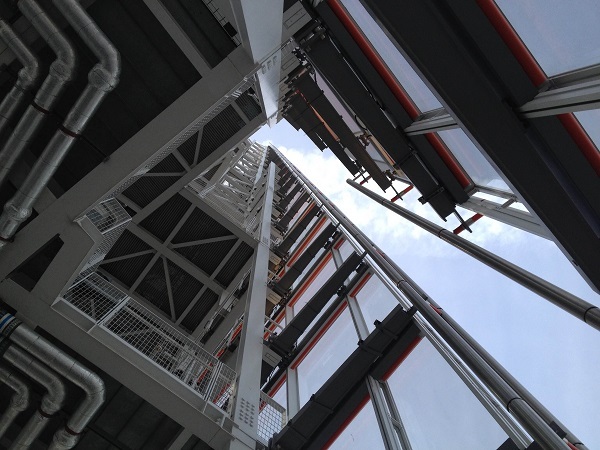 The level was sleek, spacious and the glass walls gave us ample opportunities to gaze at the clear sights of London below us. 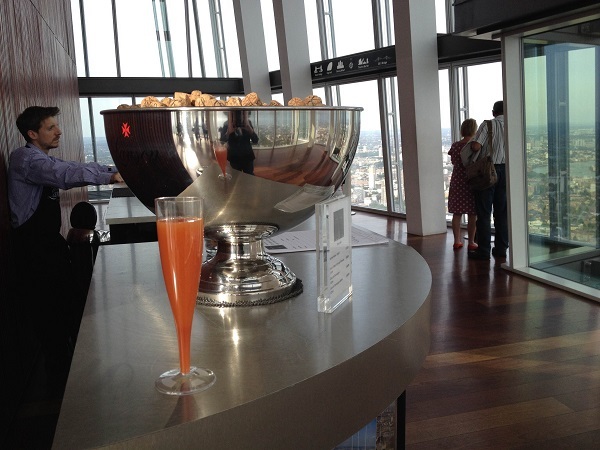 It was pretty clear why The View From The Shard is known to be a high class affair. It was truly wonderful. My nose just stopped short from the glass, my breath fogging it, I rubbed my eyes at the lazy design of the River Thames disappearing momentarily under Tower Bridge. Annora tugged my elbow to point at our next excitement of the day. There was a bar. The barman smiled at us behind the huge dishbowl of Champagne corks and asked if we wanted an Orange Mimosa. Did we? Of course we did! This really added to the classiness of the evening while we watched other people mill around the half full floor. Some were clearly on dates, a few were wide-eyed tourists from other countries exciting chatting away to each other in Portuguese and several were London locals still armed with their briefcases newly arrived from work. All had one thing in common. 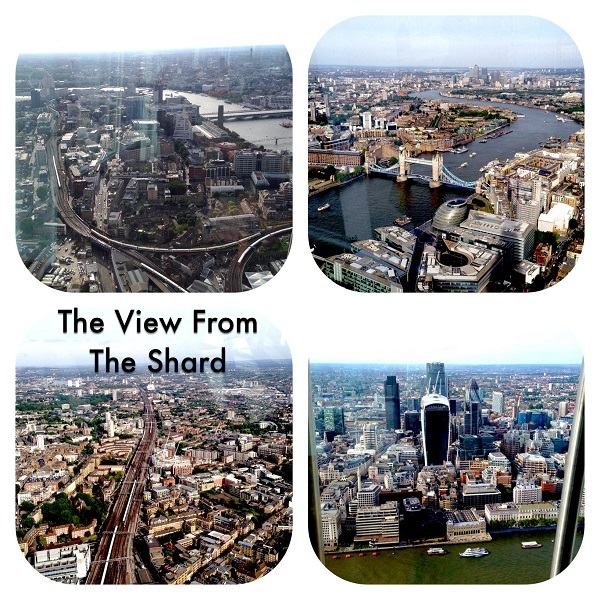 They were transfixed of the View From The Shard. You can even climb up to the next level and see the dagger like roof pierce the sky. 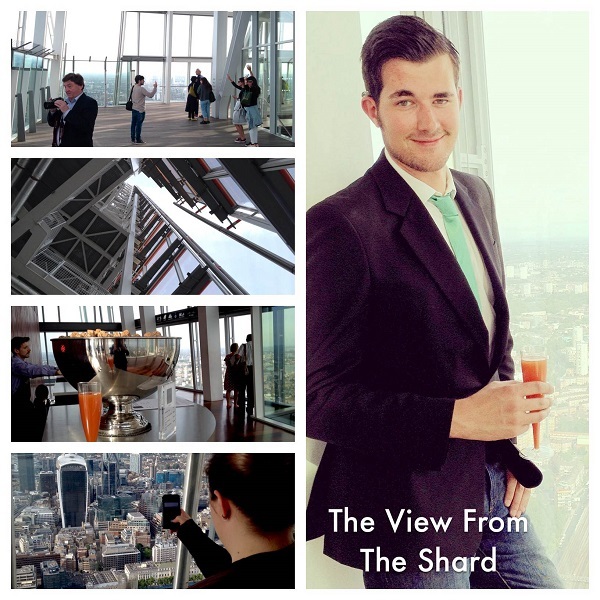 Finishing my drink, I quickly ticked off all the sights I could see from this high up – The Tower of London, Stratford Olympic Park, Hyde Park, the legendary Big Ben and even the Thames Tidal Barrier. The sky was just perfect for sightseeing amid the bright yet warm view.